Frequent Locations in iOS 7. Filed with the patent holder friendly Eastern Texas District Court, Uniloc's lawsuit alleges infringement of three owned patents relating to various consumer facing Apple services. The non-practicing entity is leveraging a set of fairly recent IP credited to Uniloc CEO and serial inventor Craig Etchegoyen. At issue are U.S. Patent Nos. 9,414,199, 8,838,976 and 8,239,852, each dealing with different technologies supposedly tied to a number of Apple products. The '199 patent, titled "Predictive delivery of information based on device history," covers a method of delivering information to a device based on its location. Specifically, the document details a system capable of predicting future locations of user device, then sending relevant data based on those predictions. 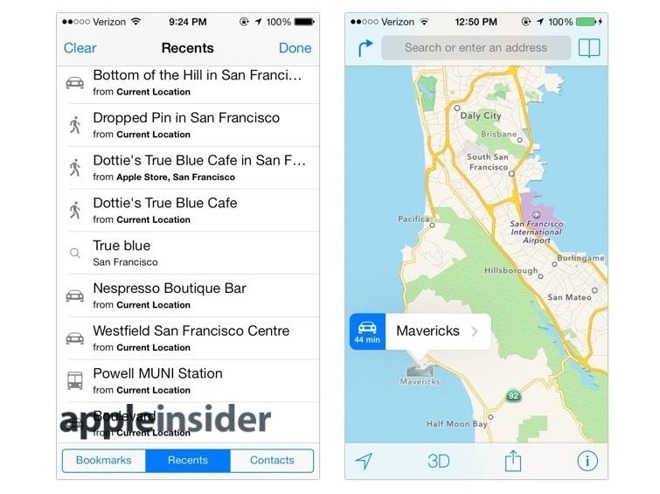 Though the patent abstract, summary and detailed description all refer to the technique as a delivery mechanism for advertisements — like SMS messages — the IP's claims are being asserted as applicable to Frequent Locations in Apple Maps. Introduced with iOS 7 in 2013, Frequent Locations is an opt-in Location Services feature that "learns" places significant to a given user. By periodically polling device positioning data, iOS is able to track the places users visit and how often they visit them. This data is compiled and can later be used to deliver personalized information. For example, the latest versions of iOS combines Frequent Locations with Maps services to furnish users with predictive traffic routing. Interestingly, today's complaint does not single out Location-based Apple Ads, which seems to more directly apply to the'199 patent. Uniloc's '976 patent for "Web content access using a client device identifier" details a method of controlling access to online assets using collected device information. In particular, the document calls for one user-configurable parameter, such as a password, and a non-user-configurable element like a device UDID. Applied to the suit, Uniloc asserts Apple infringes on claim 13 of the '976 patent by allowing users to access iTunes, iCloud, the App Store and other online services with an Apple ID. Indeed, Apple in its support documents notes iPhones, iPads and other devices use a combination of Apple ID and device UDIDs to authenticate users. Finally, the '852 patent for "Remote update of computers based on physical device recognition" covers a method of securely updating a user device with a software payload authenticated and received over the internet. As with the '976 patent, authentication appears to be a critical factor in finding infringement. Whether Uniloc can successfully argue the validity of its patent claims remains to be seen. Along with vague wording, the patents carry questionable priority dates that do not pre-date a timeline when Apple first began operating iterations of the alleged infringing services. The '976 patent, for example, was filed for in 2009, well after Apple began using unique identifiers to gate online content. Uniloc's '852 patent is also questionable, as Apple has required device and user authentication for iPhone updates since the original iPhone launched in 2007. Today's lawsuit is Uniloc's second attempt at extracting compensation from Apple over alleged infringed patents. The NPE last June filed suit against the Cupertino tech giant's Messages product for encroaching on four patents related to instant voice messaging systems facilitated through VoIP protocols. Uniloc has a long history of bringing suit against high-profile defendants. For more than a decade, the firm filed dozens of lawsuits against large tech companies including Activision Blizzard, Aspyr, Electronic Arts, McAfee, Microsoft, Rackspace, Sega, Sony, Symantec and more. Among the largest verdicts to date was a 2009 win against Microsoft over a now invalidated patent. At the time, a jury awarded Uniloc $388 million in damages for a "software activation" invention, a ruling that was overturned. Microsoft subsequently settled out of court for an undisclosed sum. Key claims of the patent later failed an examination by the Patent Trial Appeal Board, rendering it unenforceable. In its lawsuit filed today, Uniloc is seeking unspecified damages, reimbursement of legal fees and other relief deemed fit by the court.